A new method allows researchers to systematically identify specialized proteins that unpack DNA inside the nucleus of a cell, making the usually dense DNA more accessible for gene expression and other functions. The method, developed by a team of researchers at Penn State, and the shared characteristics of these proteins are described in a paper that appears online on July 12th in the journal Molecular Cell. "Our genome is very compact, which means there is an accessibility issue," said Lu Bai, assistant professor of biochemistry and molecular biology and of physics at Penn State and senior author of the study. 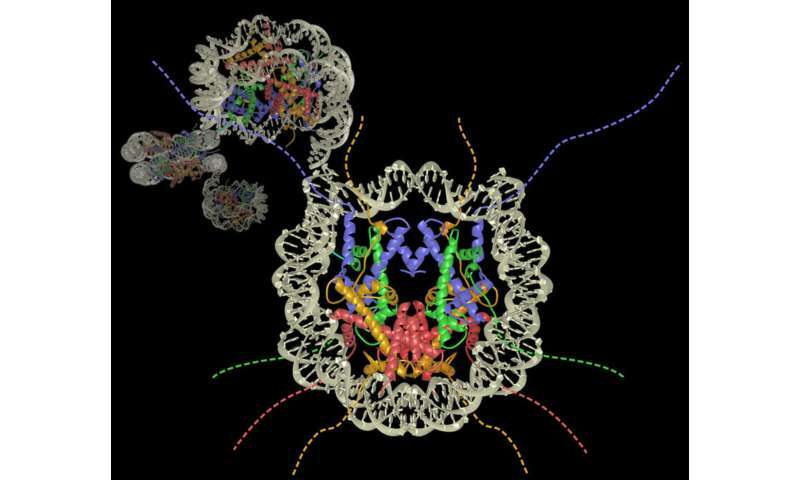 "A variety of proteins need to access DNA to copy its information into the RNA that will eventually be used to make proteins, but DNA is tightly wrapped around proteins called histones that are then packed into bead-like structures called nucleosomes. These tightly packed nucleosomes make it hard for other proteins to bind. "To solve this problem, cells use what we call 'nucleosome-displacing factors' to invade the condensed DNA and open it up. Until this study, we lacked a general method to screen for these factors and evaluate them." Nucleosome-displacing factors are a special kind of transcription factor, proteins that bind to short, specific sequences of DNA called binding sites to control gene expression. They are also known as pioneer factors in animal cells. The researchers developed a fast, inexpensive "high-throughput" method to screen and categorize large numbers of transcription factors based on their ability to displace nucleosomes. The method artificially incorporates transcription factor binding sites into the nucleosomes and examines which factors are capable of reducing the presence of nucleosomes. The researchers identified both new and previously known nucleosome-displacing factors. These factors, particularly those that strongly deplete nucleosomes, tend to be highly abundant in the nucleus and bind very tightly to DNA. "We think some of these factors can physically compete with nucleosomes for locations on the DNA to bind," said Bai. "They may take advantage of the DNA replication process, when the nucleosome is temporarily disrupted and thus frees up some DNA. Because there are so many of these strong nucleosome-displacing factors in the cell, they immediately hop onto a binding site on the DNA and they refuse to dissociate. It's hard to assemble a nucleosome on top of that." The researchers also identified some transcription factors that can displace nucleosomes without tapping into the DNA replication process. "Even though we've known about some of these factors for decades, we still don't have the molecular details of how they work," said Bai. "In the future we hope to investigate, for example, which specific parts of these proteins may be important for nucleosome displacement." In addition to identifying a suite of new nucleosome-displacing factors, this study provides a proof of concept of this screening method in the relatively simple system of yeast. The researchers plan to extend this method to more complex systems, such as mammals, and to different cell types and developmental stages. "Pioneer factors are associated with the differentiation of cells into different, specialized cell types," said Bai. "If we can map out the key factors that are involved in cell type transitions, we may eventually be able to design a combination of transcription factors to artificially direct the fate of a cell. At least, that is the dream." Any chance someone can point me to where I can see the amino acid chain or paste into a reply?